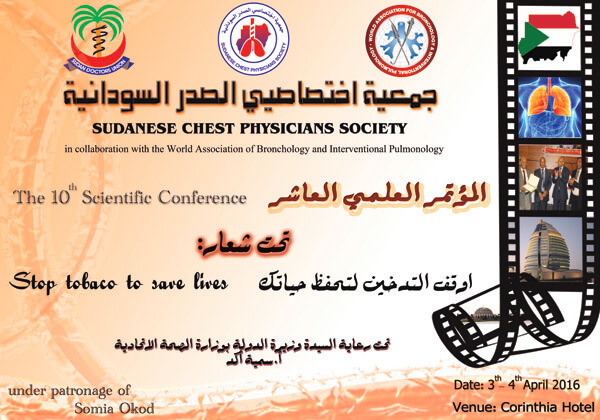 On behalf of the Executive Committee of the Sudanese chest physicians society, I would like to extend my warmest welcome to you all, to participate in this national event, which will be held in Corinthia Hotel -Khatoum,Sudan on 3-4 March 2016. It gives me a great honor and pleasure to invite all physicians with interest in thoracic medicine to attend what is promising to be exceptionally informative and enjoyable conference. The Scientific Committee is planning a very comprehensive scientific program that will cover state of the art lectures, update presentations, workshops, panel discussions, interactive sessions, and research abstract presentations covering all fields related to thoracic medicine including critical care, sleep medicine, allergy & immunology, as well as pediatric pulmonology and infectious diseases. The pharmaceutical Industry is also committed in their support of our meeting that will host a large exhibit area and many attractive opportunities to share their products and knowledge with the audience. The organizing committee is working hard to make this event a stimulating occasion both scientifically and socially. Undoubtedly, it will be a great opportunity to see other colleagues and friends and to benefit from the wide spectrum of medical topics to be discussed in this conference. For these reasons, we look forward to seeing you in this conference, so please mark your calendar and plan to participate in our preconfrence activity which will be held in Corinthia Hotel- Khartoum. I am writing to invite you to submit an abstract for presentation at our conference which is due to be held on 3-4 April 2016 at Corinthia Hotel Khartoum - Sudan Abstract submissions could be made electronically to e-mail address. 2. Abstract Title – Bold formatting. Authors Name – Initials then surname. Use Italic formatting. Author Address – no special formatting. 4. All abstracts must use UK spelling and grammar conventions. 5. Abstracts to fit on a single page, with double spacing of the body of the text. Abstracts which are not received in this format will be returned for your attention. The deadline for receipt of abstracts is 4th February 2016 and you will be informed of the Council’s decision on whether your submission has been accepted as soon as possible after this.